Velocity 2X is now available on the Nintendo Switch. Two words can best sum up this title: controlled chaos. The game has two parts: one part shoot em up, one part side scrolling platformer. Regardless of which part you are playing, it’s all about speed. Along with the previously reviewed Shantee 1/2 Genie Hero Ultimate Edition, Velocity 2X is another game perfect for speed running. 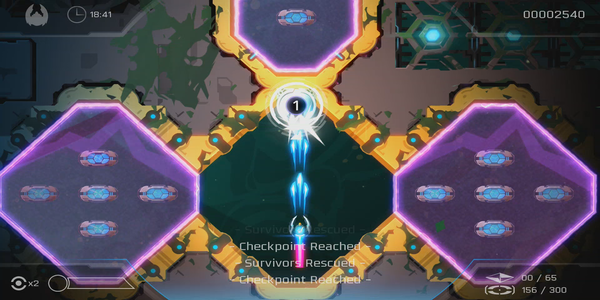 Velocity 2X is an amazing and unique indie game that really surprised me. I play multiple games every day, and it’s hard for me to stay focused on any one title for an extended period of time. 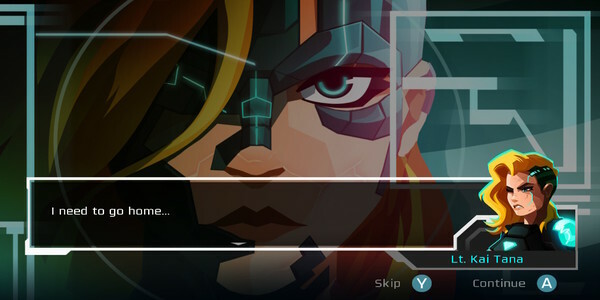 However, I fell into the trap that is Velocity 2x, and I’m having trouble tearing myself away from this one. I’m so enthralled by this that I must write about it almost immediately after playing. Velocity 2X has everything that I’m looking for lately: arcade style, high scores, leaderboards, speed running, goals, collectibles, and a fun ranking system at the end of each level. Velocity 2X consists of 50 missions plus 16 additional missions from Dual Core & Critical Urgency DLC packs as free bonus content, and it’ll have daily missions to challenge you on the leaderboards to keep you coming back for more. What’s being offered is a ton of replayability if this game suits your play style. Will you go for the highest score, the fastest time, the most completion, or all of the above? The leaderboard tracks all three of these. I bet you’re wondering what I mean with Velocity 2X being two games in one package. Some of the levels will be played in a shoot em up style. You’ll pilot the Quarp Jet in space, try to rescue survivors, obtain collectables, and punish alien baddies, all while speed boosting through and teleporting throughout the level as fast as possible. It’s beautiful in design, and the gameplay is wonderful. The second part of the game is side scrolling platforming with light puzzle solving and a little bit of 360 degree shooting. When you play these segments, you’ll be outside of your ship and on foot. Just wait till you start teleporting through the walls. Both segments of the game feel great to play and were obviously crafted, but I find I like the Quarp Jet levels just a touch more. Velocity 2X also includes boss battles. The boss mechanics are well designed and thought out, and they almost feel more like a bonus addition to the game rather than just a part of it. The game still would have been great without them, but they are so well designed, they make you want to thank the developers for their addition. I really don’t have too many complaints about Velocity 2X. The controls took a little getting use to. They have a controller layout that you can look at, but the first handful of missions cover the controls bit by bit, and I would just recommend replaying those missions over and over until you feel comfortable with the controls. It’ll take a few times before it starts to become muscle memory, but once it does, it really helps. While the controls can be a bit confusing, try not to let that keep you from playing Velocity 2X. You will get used to them. For example, when you’re boosting and teleporting, the teleporter is triggered using the ZL and left stick. Basically you hold ZL and a reticle pops up on the screen, you use left stick to control the reticle, once it gets to a location you want to teleport too you let go of the ZL button. If the reticle is in an area you can teleport to it will be in white. If it’s red, the teleport will be canceled, and you won’t go anywhere. Mastering this while speed boosting is part of the game and may cause those moments where you freak out, but once you master moves like this, the feeling is beyond compare. Velocity 2X can be played in docked, hand held, and table top modes. I found docked to be the best way to play due to screen size. I just wasn’t enjoying hand held or table top as much. Table top felt almost strange for some reason, and I can’t quite put my finger on why. Maybe it was partly due to the controls. 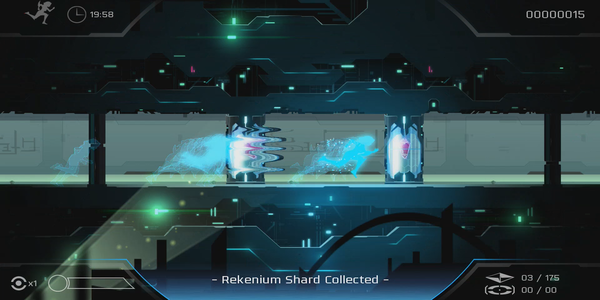 Velocity 2X isn’t your standard shoot em up; because of the puzzle aspect, you will have to think before you act. 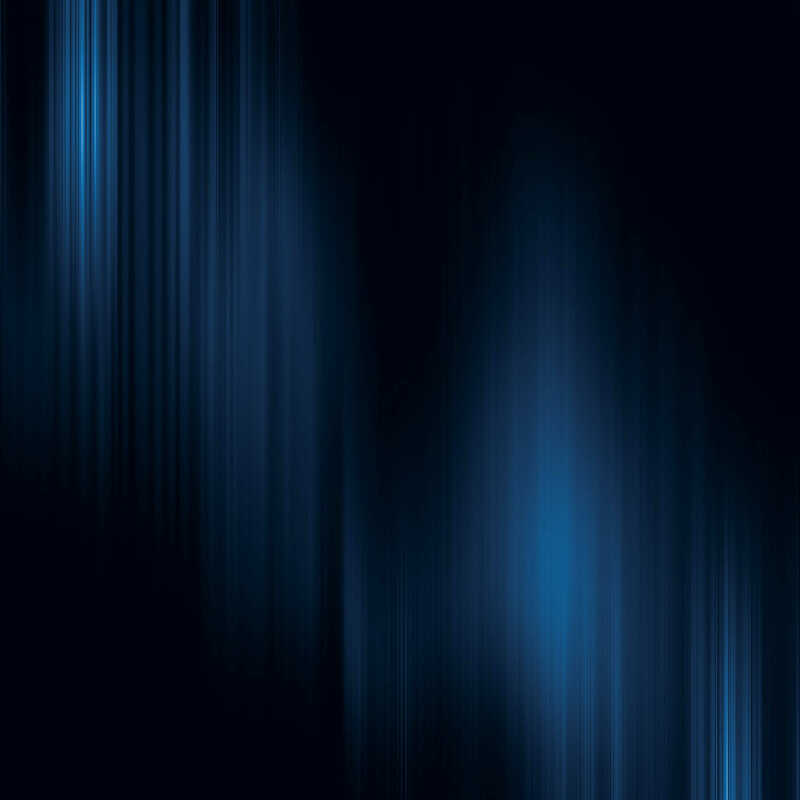 Luckily, as long as you are not boosting, the screen moves rather slowly. Velocity 2X the sequel to Velocity. I can’t compare this game to the original, as I have not played it, and the Velocity 2X is currently the only one available on the eShop. Velocity 2X is available on the Nintendo eShop for $19.99 USD. My dream price for this would be $14.99 USD. If you consider the DLC packs are free, then I suppose you could say the base game was $14.99 and the difference is the DLC, but I’ll let you be the judge on that one. The file size for this is 1.7 GB. This entry was posted in Post, Reviews, Switch. Bookmark the permalink.